Financial recycling is putting a gold polish on the initial public offering of a Chinese copper company. Just 15 months after it quit the New York Stock Exchange, China Metal Resources Utilization is set to go public in Hong Kong at 10 times its last market value. It’s the first of a large group of unloved stocks to perform the “Chinese flip”, exploiting the valuation gap between U.S. and Hong Kong exchanges. Originally a biodiesel producer called Gushan Environmental Energy, the company listed in New York in 2007 with a valuation of $800 million. As demand for fuel dried up, Gushan turned itself into a manufacturer of copper wires and other products from scrap cars. Amid low liquidity in its shares, Chairman Yu Jianqui took the company private in October 2012 at a valuation of just $30.7 million. Renamed China Metal, the company is now aiming for a market capitalisation of $305.7 million, based on the mid-point of the IPO price range. China Metal holds most of Gushan’s operating assets. Though revenue at the divisions it inherited grew 41 percent in the nine months to last September, gross profit fell. While in private hands, it also spent 60 million yuan ($10 million) on two companies that sell communication and power transmission cables. These now account for one third of its total revenue and 60.5 percent of its gross profit. Overall net profit in the first nine months of 2013 was 44 percent higher than in the whole of 2012. The bulk of the valuation polish, however, stems from favorable government policies. Almost 85 percent of China Metal’s profit growth came from tax refunds and subsidies in return for the company’s use of scrap materials, its employment of disabled staff, and support for the development of Western China. There’s no guarantee that these preferential policies, which Gushan mostly tapped after it delisted, will be renewed as they expire. Other Chinese companies like Carlyle-backed display advertising firm Focus Media and a raft of mobile online games makers may choose a similar path. Pork producer Shuanghui, which bought US rival Smithfield, has changed its name to WH Group in preparation for a Hong Kong IPO. China Metal’s recycling success will only encourage others to go for gold. 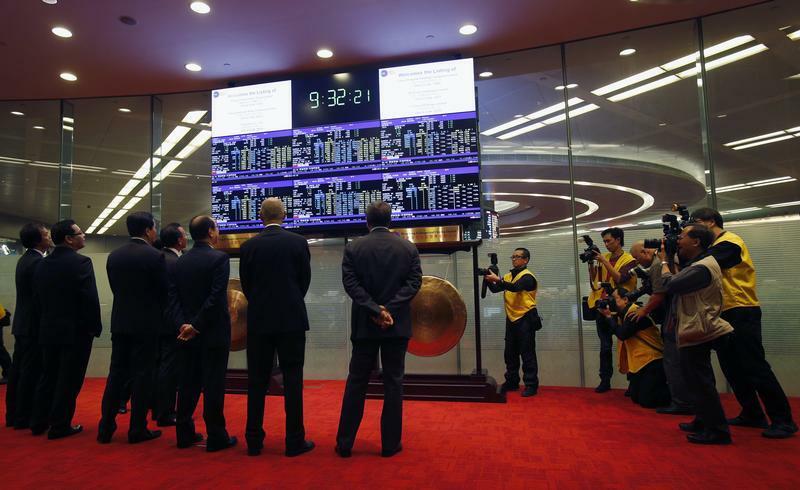 Top executives from six companies, including China Everbright Bank, and a representative from the Hong Kong Stock Exchange, watch a panel displaying share prices during their debut at the Hong Kong Stock Exchange (HKEX) December 20, 2013. China Metal Resources Utilization has raised HK$698.9 million ($90.1 million) from an initial public offering (IPO) in Hong Kong fifteen months after it delisted the business from the New York Stock Exchange. The manufacturer of recycled copper products priced its offer of 618.5 million shares at HK$1.13 per share, the Wall Street Journal reported on Feb. 17. Almost 85 percent of the offer will be made up of new shares. China Metal will have almost 2.1 billion shares in issue after the IPO, implying a market capitalization of HK$2.37 billion excluding the over-allotment option. The company, formerly known as Gushan Environmental Energy Limited, was listed in New York in 2007 as a biodiesel firm with a valuation of $800 million. Its chairman Yu Jianqiu took the company private in October 2012 valuing it at $30.7 million. Yu will not sell any of his shares and will own 45.7 percent of China Metal after the IPO. VMS Investment Group, a holding company incorporated in the British Virgin Islands, agreed to purchase up to 25.1 percent of the shares offered in the IPO. Net profit at China Metal rose 90 percent to 92.3 million yuan ($15.2 million) for the twelve months ending in December 2012, of which 60 percent came from VAT refunds, government grants and subsidies. BNP Paribas is the sole global coordinator, sponsor, and book runner for the IPO. The shares are due to start trading on Feb. 21. China Metal could not be reached for comment.